Approximately 25 of the FGBC’s top leadership people–including moderators, elected representatives and national organization representatives–are meeting yesterday, today and tomorrow in Sacramento, CA, to discuss current priorities, strategic directions for the future, and much more. Three new Fellowship Council members are attending their first meeting — Robert MacMillan from Tracy, CA; Dan Gregory from Columbia City, IN; and Ron Smals from Ocala, FL. 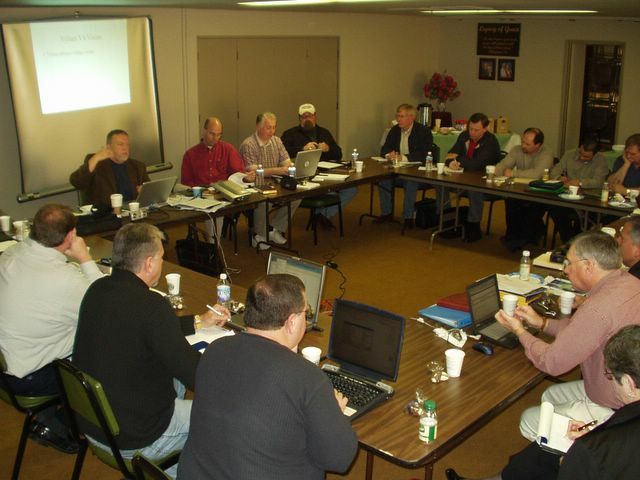 Ashland, OH pastor Dan Allan (right of screen, red shirt) is this year’s FGBC Moderator and is conducting the Sacramento meetings. FGBC Conference Coordinator Tom Avey (under screen) this morning presented his view of the present state of the FGBC.